While we love the intensity and pressure of the Porsche Carrera Cup, Australian GT and the Bathurst 12 Hour, we also enjoy the relaxed nature of the Porsche GT3 Cup Challenge Championship, so we were looking forward to see how well we had prepared our new drivers for the 2017 season. 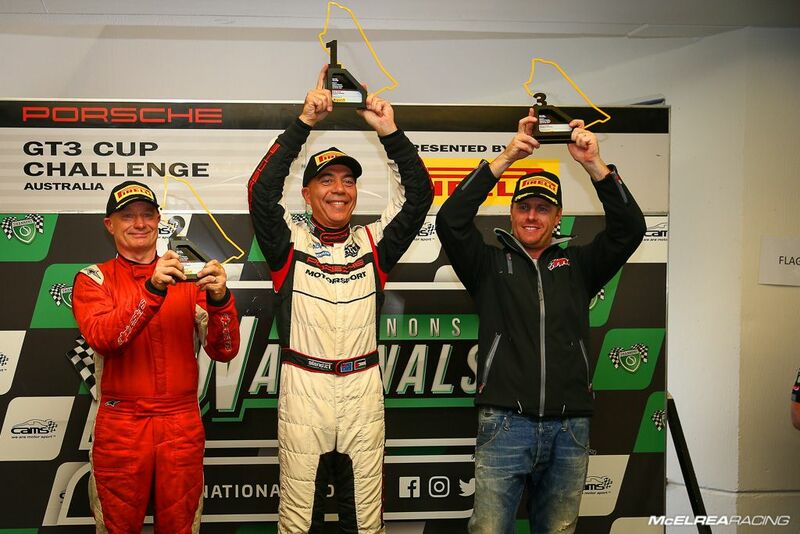 Since winning the 2016 GT3 Cup Challenge 'Elite' Championship and just missing out on the 'Pro Class' Championship Tim Miles and Jaxon Evans have stepped-up to the AGT and Carrera Cup respectively so we have started the 2017 GT3CC season with an all-new driver line-up. 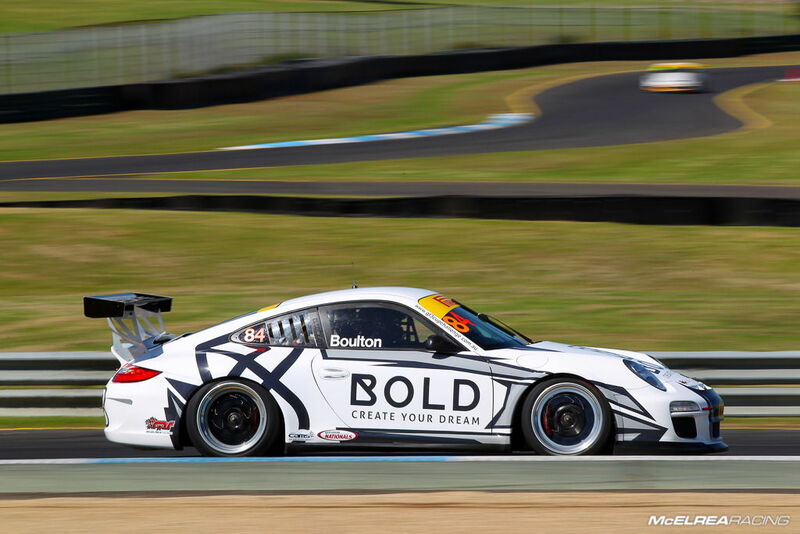 Anthony Gilbertson has joined MR in his quest to win the 2017 GT3CC Elite Championship and he is joined by GT3CC rookie and relatively inexperienced Brett Boulton. 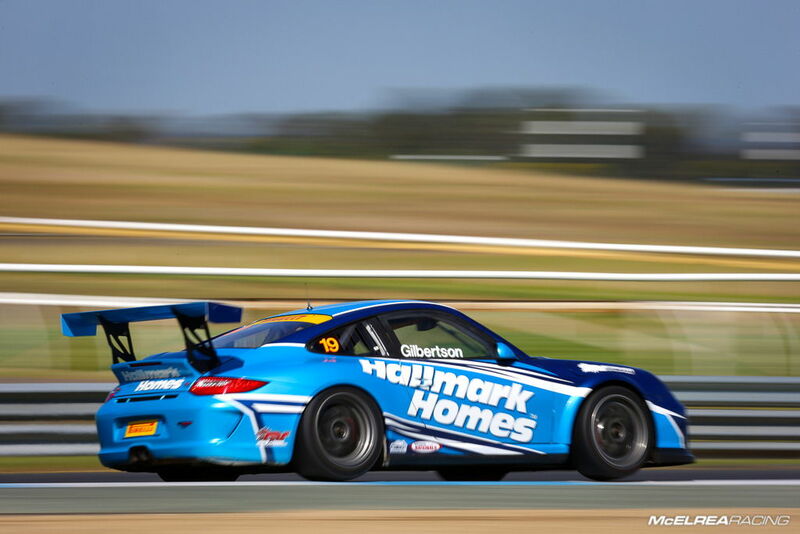 After qualifying comfortably fastest in a large Elite (semi-professional) field and less than a tenth of a second off outright pole (including the pro drivers), Anthony Gilbertson was caught-up in an unfortunate tangle after passing a slow starting Grove in pole position. He quickly went from 'leading the race' to 'in the fence', all before the first corner. The awesome MR crew did an extra couple of hours work to get the car back into race trim for Sunday's races. Race 2 was on a very wet and treacherous track. Anthony started from grid 15 and he had to deal with heavy traffic off the start and in the opening laps, but did a great job to pass 10 cars with easily the fastest Elite class lap time to finish 5th outright and 4th in Elite. In the third race he got a good start in the wet conditions and demolished the other Elite class drivers in an outstanding drive back to second outright and 1st in Elite. Despite his DNF in race 1 he was still able to bag enough points to make it onto the podium with third for the round. Considering this was Brett's first ever visit to Sandown, we were suitably impressed that he was able to qualify 10th in Elite class after only two practice sessions on Friday. 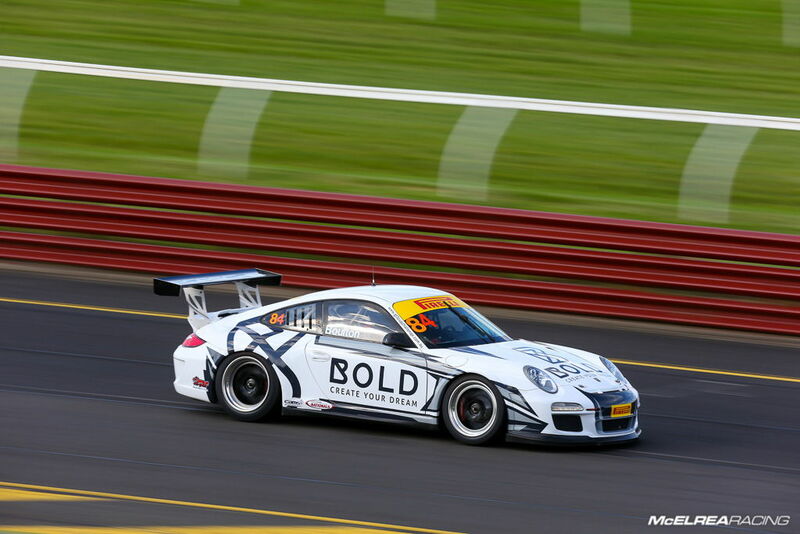 In race 1 he backed up his qualifying form with a good start and thoroughly enjoyed his first ever Porsche race. He kept out of trouble and finished an impressive 8th in Elite. In race 2 Brett started 10th in his first wet Porsche race but kept his cool and learned plenty about the different technique of wet weather driving to finish 11th. In the last race Brett 'the big maan' completed his impressive first round by finishing 10th outright and 8th in Elite. Of all the new drivers we have brought into GT3CC, Brett certainly had the trickiest and most challenging conditions to deal with on his debut. While we were hoping that Anthony would leave first round of the championship at Sandown with the Elite Championship lead, we are quite satisfied with third, after a disastrous race 1, knowing he has the raw speed to win, as illustrated by his pole position and fastest race laps. We couldn't be happier having Brett in the team, like Anthony he is a top bloke and there are plenty of laughs whenever he is around. We have no doubt he will win some trophies this year. 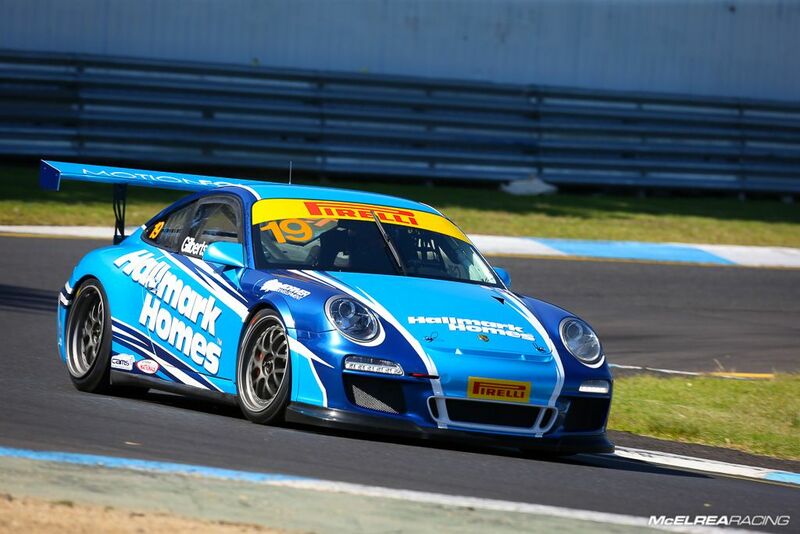 Next stop is Perth for AGT, then Phillip Island when we will be running three teams in one weekend... GT3CC, Carrera Cup and a potentially expanded AGT team. As usual, many thanks to supercoach Luffy, team manager 'Lethal' Leigh Geyer and the awesome MR crew.